We empower you to bring up baby in a natural, affordable way. Pre-conception through childhood is the most critical time of one’s life. You need to protect your baby. Your starting point is to go green by avoiding harsh chemicals and toxic ingredients. But sometimes that comes with a cost. That’s why we created Green Baby Deals. Listen up: climate change is happening now, and we must all do our part to make this planet better. Every choice we make today can have an impact on our children’s tomorrow. Sustainable, recycled, eco-friendly, non-toxic, organic, green, natural, reusable – when these words are describing a product or process, it typically means it’s made with the least amount of adverse impact to our environment. That’s what we want and need. We can make small changes by choosing products that don’t contain harsh chemicals that go on our bodies and into our waters. Buy from businesses that use sustainable practices. Consume less. Conserve water. Buy used. It shouldn’t be such a challenge to keep your baby safe, help the planet, and stay on budget. That’s why we’ve created the “GBD Approved” seal. It easily shows you the best products in each category. When you make the right choices and take the steps toward a greener, more sustainable living, it means a healthier lifestyle for you and baby. That’s a win-win. No guessing games here. While it’s nice to leisurely look through “good, better and best” articles, it can get pretty overwhelming. And you might even end up more confused than when you started. We keep it minimal. We’ve been through pregnancies and parenthood. We tell you what you need and what you don’t. 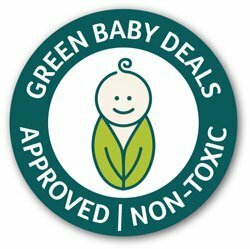 Green Baby Deals is the balance between all-organic and totally-affordable. Coupon queen. All-in green. Nutritional consultant. Learning-as-she-goes mom (aren’t we all). Wife. Creator. Wild about pregnancy and babies. Water birth enthusiast. Beginner minimalist (hopes to be expert someday). Continuously mindful about buying and consuming. Believes we can end the crazy cycle by not purchasing so much. Aspires to live off the grid someday. Loves cloth diapers (but too frugal to buy the adorable limited-edition prints). Reuses baby wipes (in a sanitary way). Favorite video: The Story of Stuff. “It Starts with the Egg" began her non-toxic journey. Super mom. Teacher. Diligent researcher (Google Scholar, DOAJ and Environmental Working Group are bookmarked on all her devices). Loves eating organic fruits and veggies from the backyard garden (but doesn’t like to get too dirty maintaining it). Fascinated with living in a tiny house if she wasn’t claustrophobic. Favorite online rockstar: Katie from Wellness Mama. There is nothing more rewarding than helping others in need. Each month a portion of our proceeds are donated. If you have a charity you’re passionate about, drop a line here. A million thanks for helping to make a difference. Meeting new moms makes us happy. Send a hello here or join our free deals by inbox here. Get exclusive deals, tips & tricks. Like taking candy from a baby. © 2019 Green Baby Deals. All Rights Reserved.